Today was another meaningful day of coming close to the footprints of Jesus. Our first stop was Cana, the location of Christ's first miracle, the turning of water into wine at the wedding in Cana. We visited a church that had been built upon the so-called spot where this event took place. 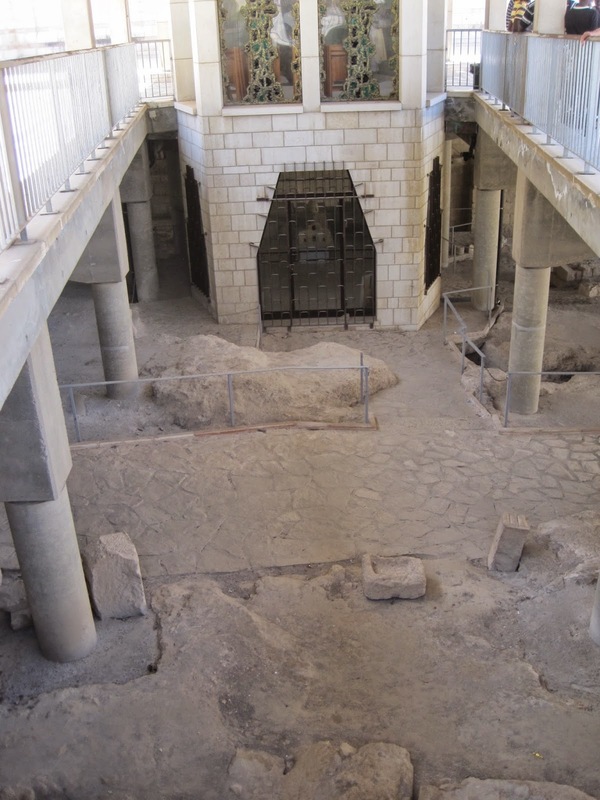 Of course, there's no way of pinpointing the exact spot, but just being in Cana, knowing that Jesus had indeed been here, was pretty special. 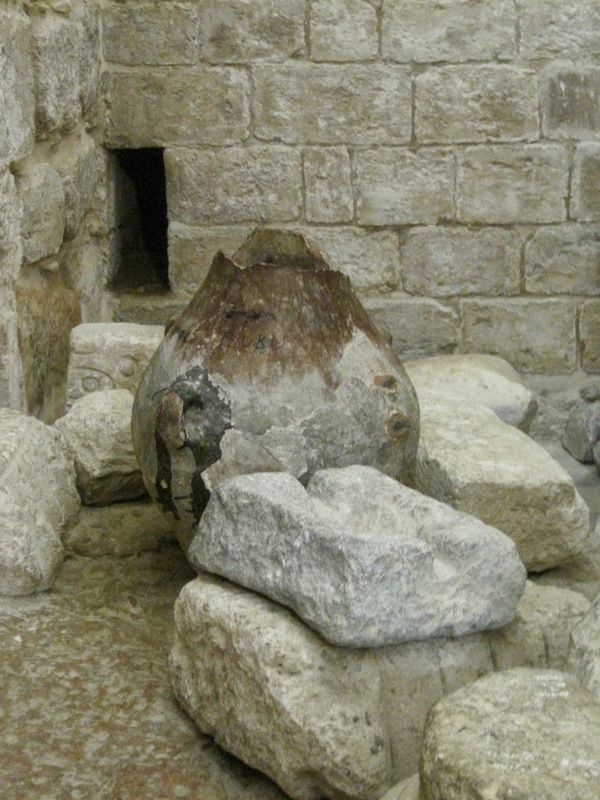 Archeological digs have unearthed large pots which would've been used for water and wine. 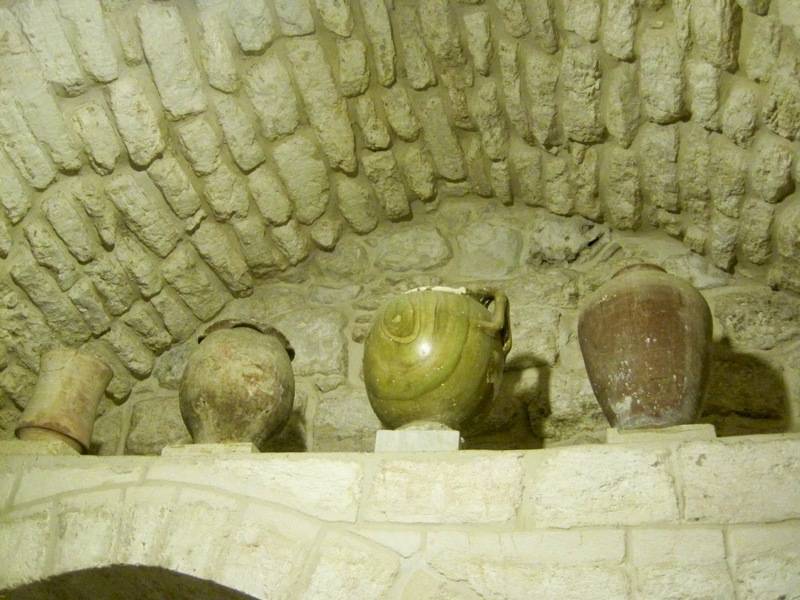 While the place looks virtually nothing like it would've when Jesus was attending weddings, it was neat to see the unearthed pottery and imagine life in this little town. 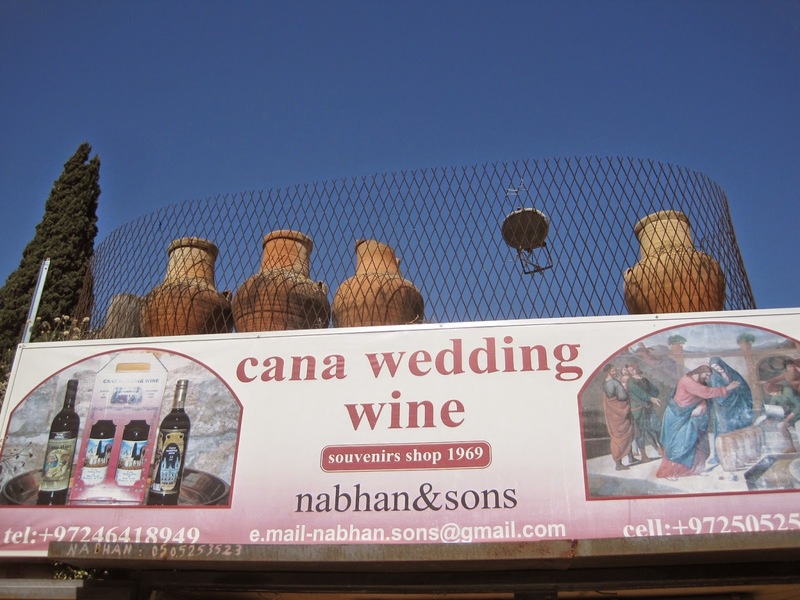 Of course, local merchants have capitalized on the biblical narrative and you see Cana Wedding Wine shops all over the little village. One shop was offering a taste of the wine of Cana and the bottles were labeled with touristy clichés. I guess everyone's gotta make a buck (or a shekel) somehow! 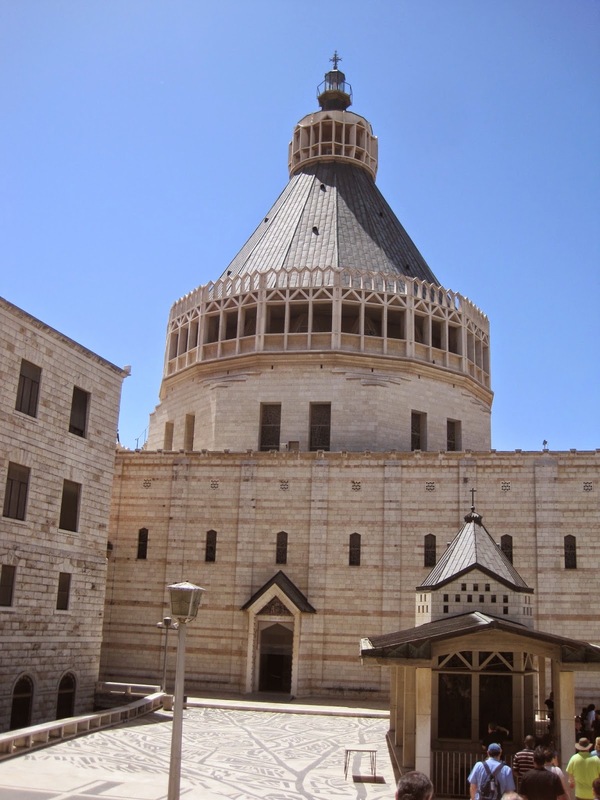 From Cana we journeyed on down the road to Nazareth, where Jesus grew up with Joseph and Mary. 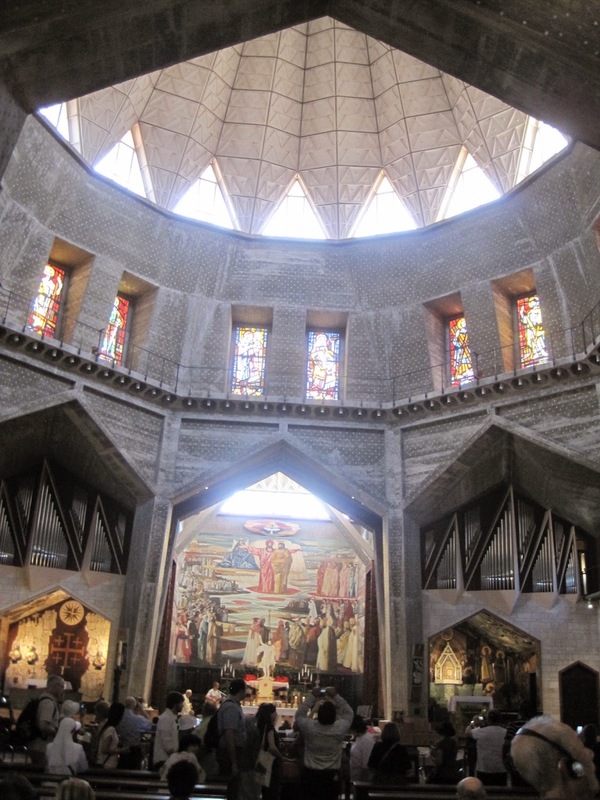 The city is very modern and quite large but the church of the Annunciation dominates the tourist trade. 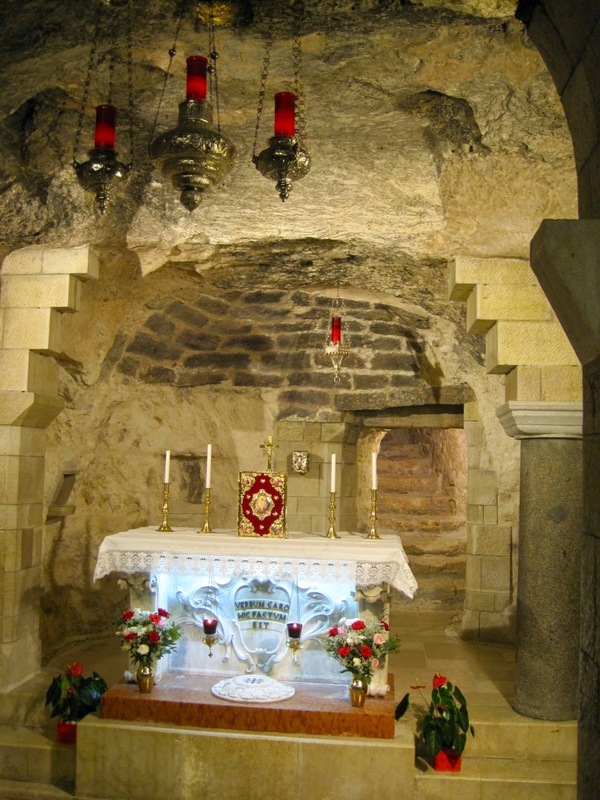 In this little square, digs have uncovered what they believe to be the site of where the Angel Gabriel visited the young Mary to announce that she will indeed bear the Savior, Jesus Christ. 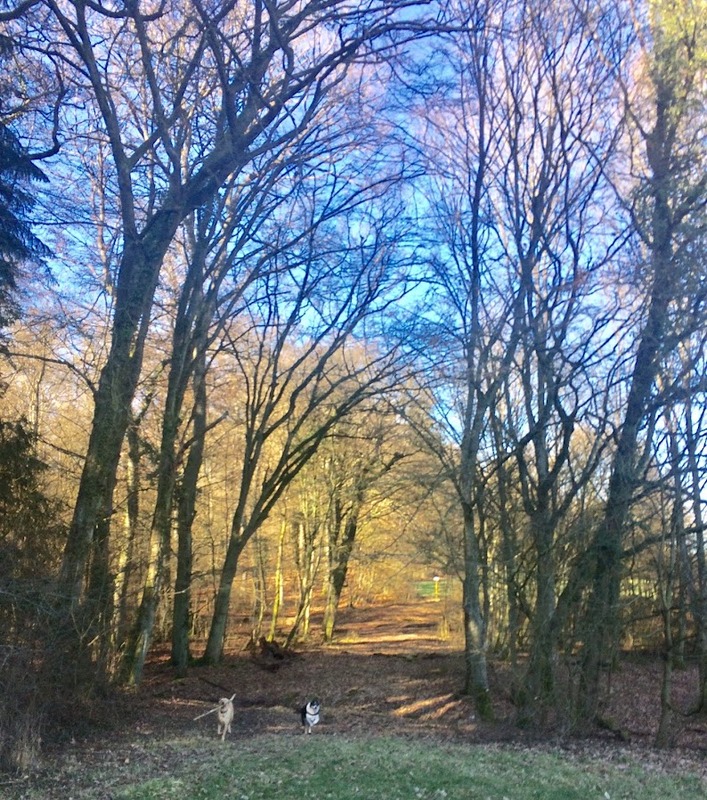 The place is a little cave, a common dwelling in those times. The cave itself is interesting, spruced up a bit with modern religious elements but generally speaking, it was still a nice experience to walk in that place and ponder what life must've been like for Mary when the angel visited her. I was pleased with the church itself. 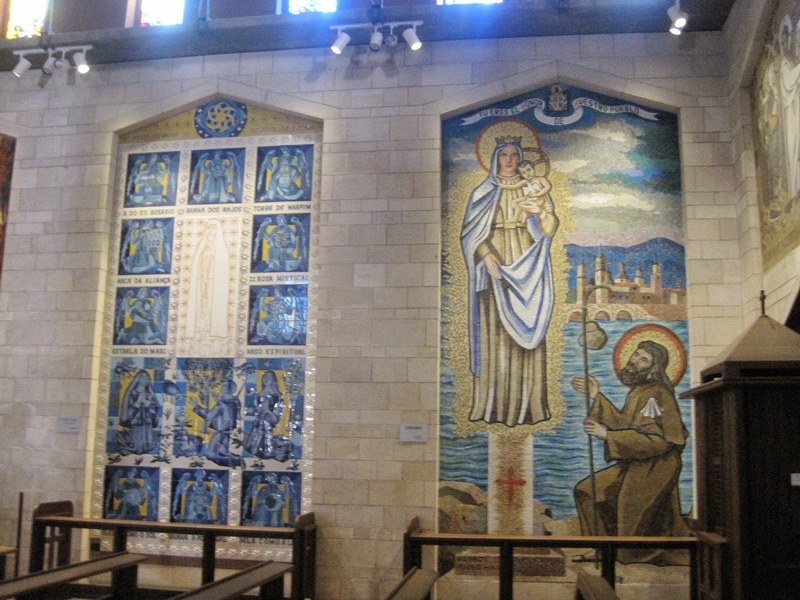 The sanctuary was lovely and the walls are dotted with artwork that many countries have donated to the church with a cultural depiction of Mary and the baby Jesus. It was neat to see some ethnic features in each of the pieces. I did not like the one from the U.S. Mary looks angry or evil and the baby Jesus isn't really even present. 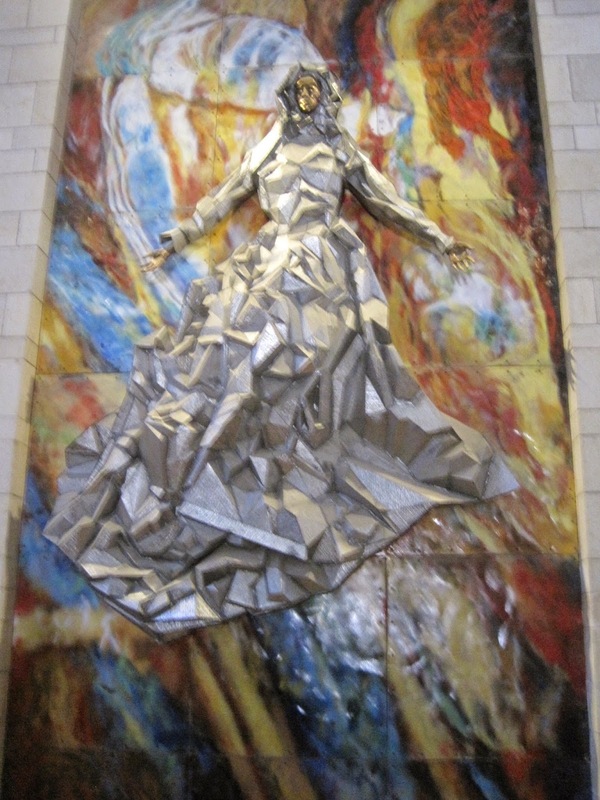 But the statue outside of the sanctuary depicting the annunciation was really beautiful. Such is art. In addition to the church of the Annunciation, another spot nearby commemorates Joseph and his little carpentry shop. 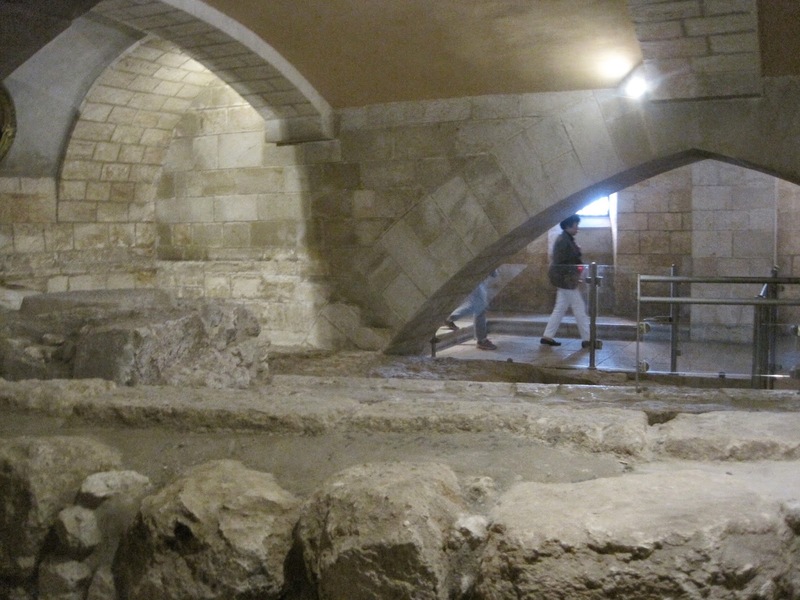 Again, these points are symbolic rather than exact but these sites do give you a great idea of what life was like when Jesus was running around Nazareth as a young boy. To think that archeologists have uncovered these ancient ruins and thus can give us clues as to what life in Nazareth was like when Jesus was growing up is a real feat unto itself. 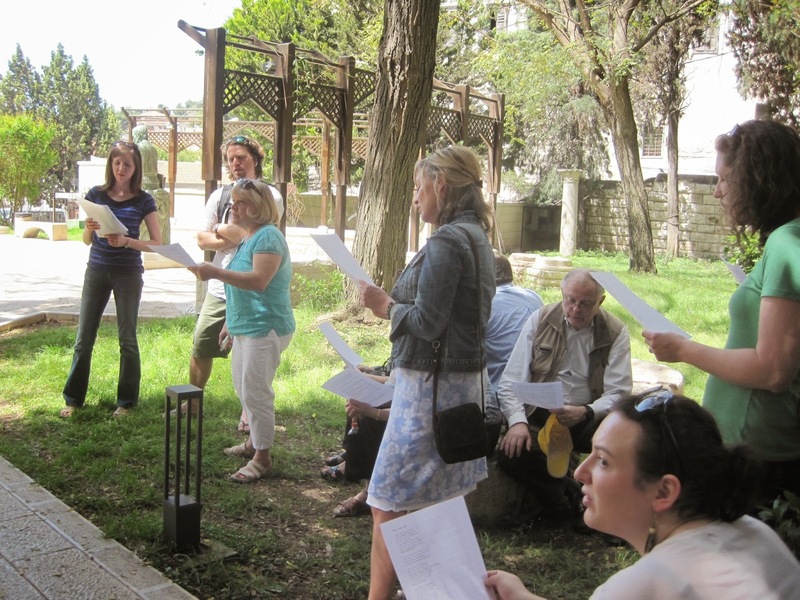 In the shadow of both the church of the annunciation and Joseph's chapel, we stopped to share in a time of devotion. 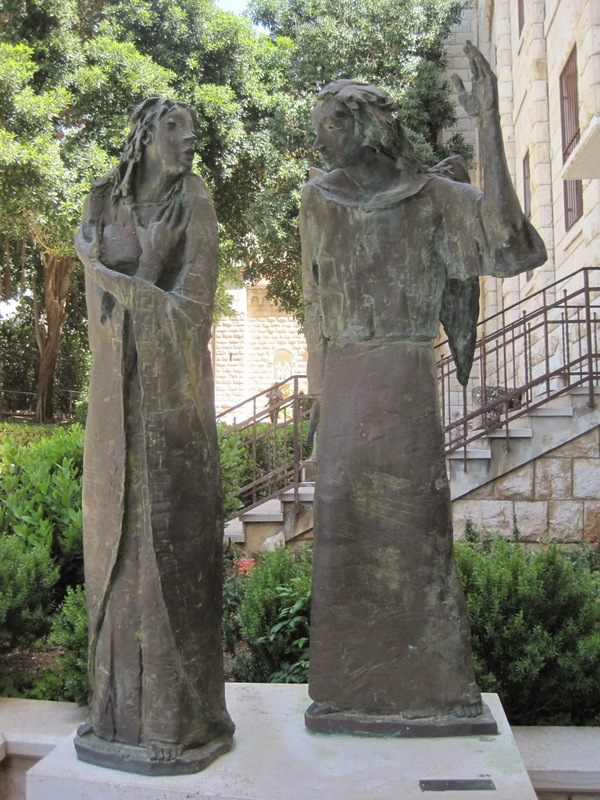 The leaders emphasized the ordinary nature of Mary's life and even of Christ's as he grew up in this neighborhood. The point being that Mary made herself available and said yes to her calling, even in the midst of her very ordinary circumstances. That we should be willing to do the same was the calling. It was great. After lunch some of us ventured into the town of Tiberius. 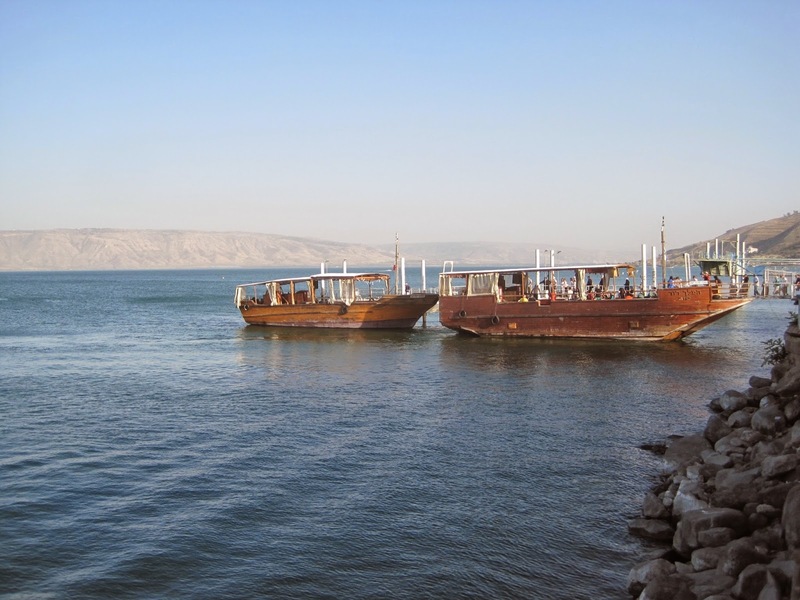 Located on the sea of Galilee, modern day Tiberius was much like any seaside town. Fun to imagine the comings and goings of the folks who lived in the biblical era. I will have a good mental picture to draw upon when I encounter Tiberius in my scripture reading in the future. It was a very hot day. Some thermometers were measuring 100°F. The air conditioner on the bus broke on the way back to the hotel so it was a real roaster of an afternoon. We cooled off with a dip in the sea of Galilee as the sun began its decent. It was refreshing and clean. 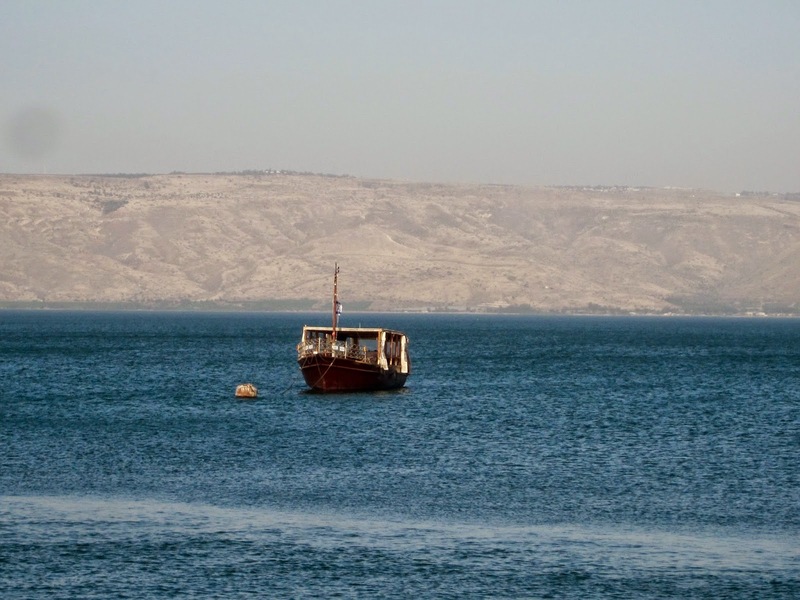 Hard to believe that at one point in time, both Jesus and Peter swam in this same body of water. A thrill to experience indeed. Our evening ended with a bonfire on the beach and some structured sharing time followed by warm conversations around the fire. What a peaceful, joyful, beautiful night it was, on the shores of the Sea of the Galilee. Tomorrow, we're off to Bethlehem! Delayed, but Finally Made It!